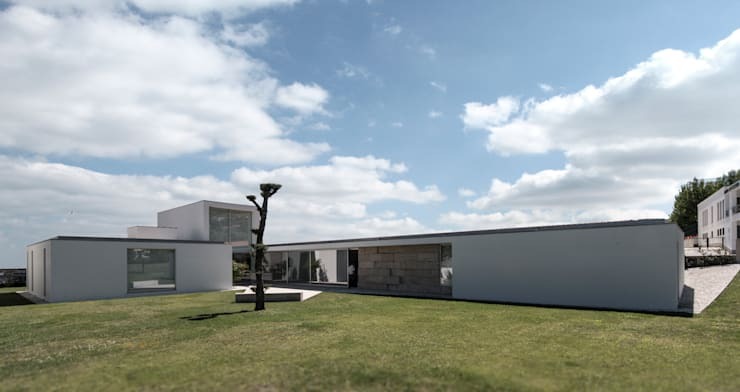 3h Architects, based in Matosinhos, Portugal, are known across many fields of architecture (including residential, commercial and industrial) for creating impressive modern structures. 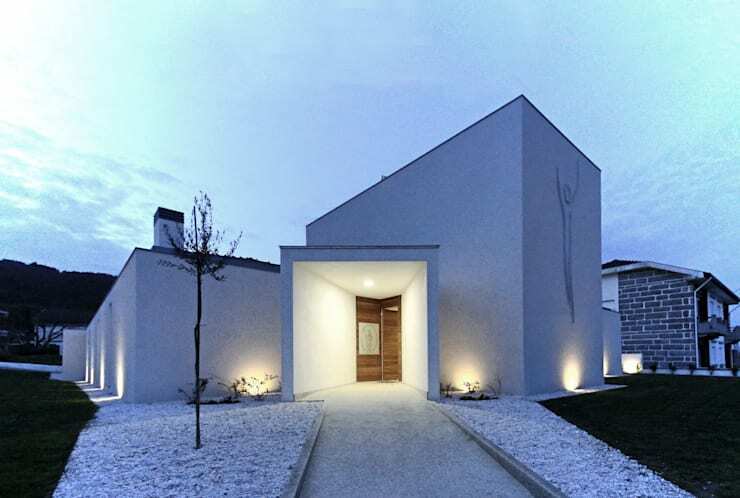 With the project we're visiting today, you will certainly be able to see the capabilities of this architecture firm in creating an ultramodern building for something as traditional as a church parsonage. 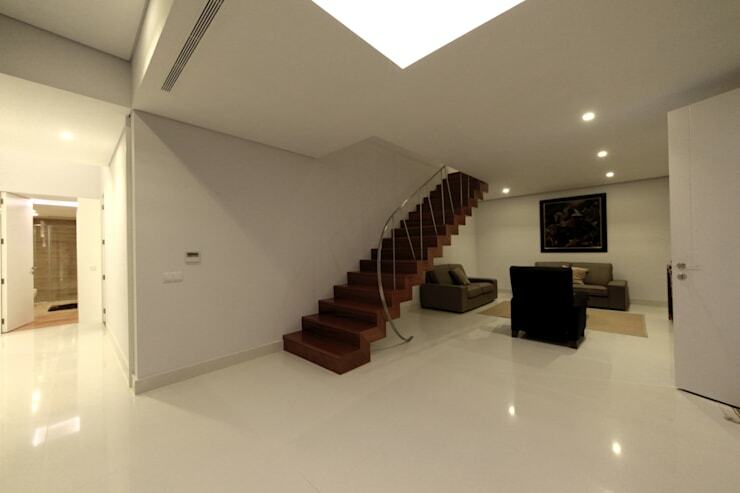 We're sure you'll agree that this modern and minimalist design would be suited to any contemporary residence. Being around since 2003 has definitely given 3h Architects an advantage in home design, allowing a wealth of experience in the field. This is evident in the accuracy and attention to detail we will see in the structure of this house, as well as in its interiors. Let's take a trip to Portugal to see this house up close! Although this Portuguese parsonage is far from humble in structure, the building still manages to project an ethic of simplicity and humility. We often find, in our times, that most new projects and products tend to be more and more ostentatious and overwhelming in a sensory capacity. This house does not succumb to such trends, and proves its aesthetic value in its apparent asceticism. This does not mean, however, that the building is sub-standard in any way. On the contrary, high-quality materials had been used, which are classic, albeit simple. The perpendicular angle formed by the shape of the house creates a delineated lawn space, ideal for back yard dining and recreation that's a little more private. It should be quite difficult for anyone to disagree that the entrance of this home looks as tranquil as imaginable. The stark white building is softly offset by warm lighting on the lower perimeter of the structure, and attention is drawn to the inviting entrance by the fully-lit alcove. There are several geometric volumes that fit into one another to create this composition. This design is compatible with the current trends in architecture, but has a stately, timeless look to it at the same time. To augment the feeling of tranquillity that the ensemble projects, the front garden is decorated by white stones around the walkway, much like a Zen garden. All of this, against a pale blue sky, seems like a heavenly sight in itself. Judging from the façade of the the home, we can surely expect to find a calm and stately interior. What we see in the entrance hallway definitely confirms this. They wide open space is entirely white, floor, walls and ceiling. This enhances the minimalist appearance of the area, making it look larger, although it is already devoid of excessive furniture and decoration. 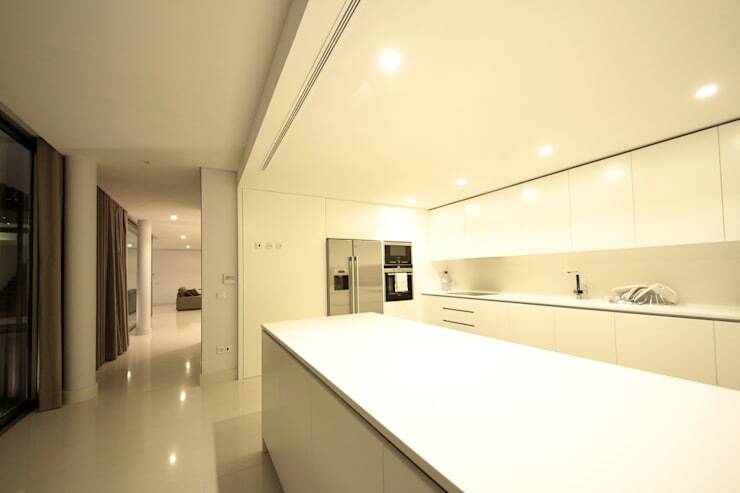 The large white tiles provide a sleek look, and the glossy surface reflects even more light to expand the space. At the back of the room we can see a small lounge, and in the centre to the left, we see a dark wood straight staircase leading to the second floor. The railing is slightly ornamental in the space otherwise devoid of ornamentation, just to add a touch of style. The kitchen is also defined in as an all-white space, with the addition of white cabinets and counter tops. Perimeter lighting border the crown mould ceiling above the kitchen space, to ensure a complete lighting scheme suited to the what tasks needs to be completed here. The light fills nearly every corner of the room and the white surface reflect it where the beams from the lamps fixtures can't reach. The storage space is streamlined into the structure of the room, and so are the appliances, ensuring a perfectly simple space. It is a modern kitchen which is humble in appearance, ensuring a stylish timelessness that can be customised to the inhabitants' needs, if so desired. From this image, it is clear that the rest of the interior of this house follows the same recipe for success: simplicity and sophistication. Here we can see the dining room on the left hand side, which is really just a demarcated area in the open-plan design of the home. Classic furniture is complemented by a warm ceiling lamp and Persian carpet. 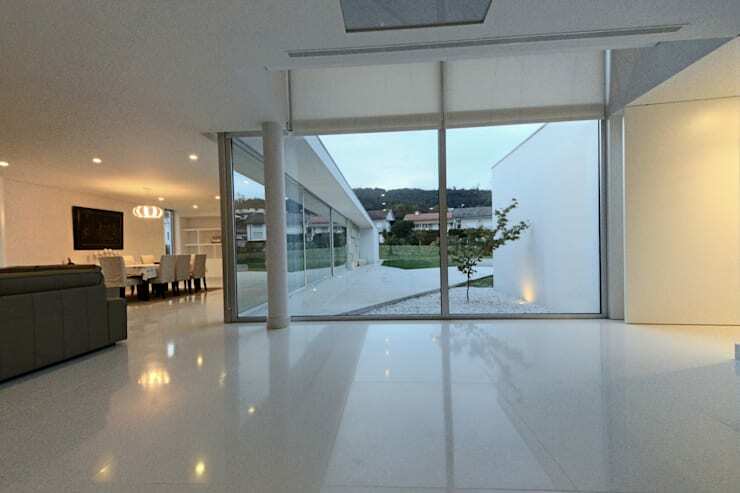 This entire space of the home, which can be seen as the social areas of the building, is bordered by glass windows to the inside of the structure. This means that any spot on the lower level will have a view to the outside. Not only does this allow ample natural light to fill the home, but it also ensures a connection with nature and the outside world. What's more, it brings a sense of transparency to the residence—a quality admired for the home of a religious or spiritual leader. Lastly, we find ourselves back outside to take a look at the building from another point of view. From here, the pure minimalism of the project is very apparent. This is so appropriate as the base for a spiritual leader—taking everything back to the basics and finding contentment in simplicity. Outside we see a geometrically divided courtyard, which brings nature and man-made materials into balance. On the left side we find a single, young tree amongst a white pebble bed. On the right of the diagonal divide there is a concrete walkway. The balance between nature and man here reflects the responsibility of people to be the custodians of the earth, and this is once again affirmed in the simple, minimal nature of the whole building. For more insight into minimalism, take a look at: Your Handy Guide To Minimalism. 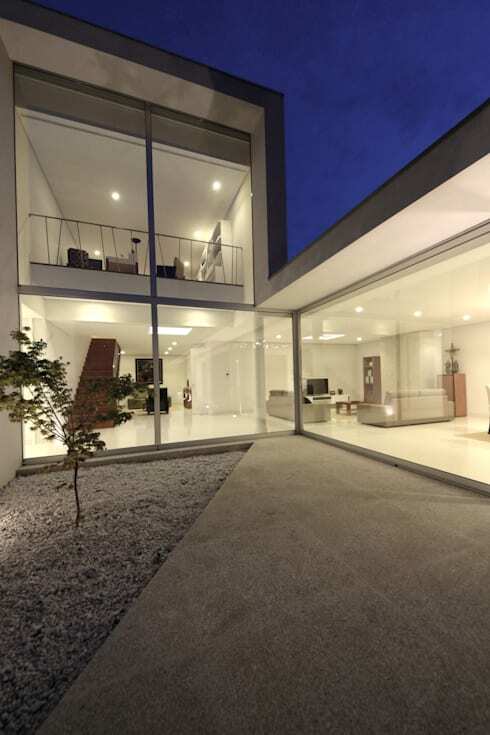 What did you think of the minimalist design of this home? What do you generally think of minimalism as a style? Let us know!